The International Classification of Functioning, Disability and Health (ICF) is a framework for describing functioning and disability in relation to a health condition. It provides a common language and framework for describing the level of function of a person within their unique environment. More information on the ICF can be found at International Classification of Functioning, Disability and Health (ICF). The ICF has been used in various ways in relation to research and clinical practice involving users of wheelchairs. 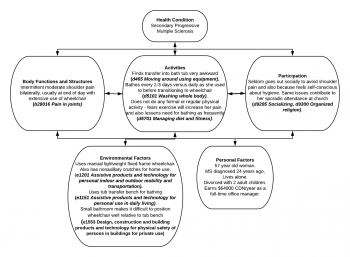 Similarly, Requejo et al (2015) noted that limitations and restrictions imposed by possible pain and dysfunction in wheelchair users can be defined using the ICF. The authors stated that the ICF can be used both to identify key elements that must be addressed during rehabilitation and also for guiding the provision and classification of assistive technology. Thus, using the ICF can reduce the risk of a mismatch between the needs and capacities of the patient versus the type of wheelchair he is provided, which can in turn decrease the risk of pain, fatigue, pressure ulcers and increase quality of life, confidence and community participation. Mortenson et al (2008) used the ICF to evaluate wheelchair-specific outcome measures in relation to wheelchair activity and participation. They found two issues when using the ICF for this purpose. First, the majority of items in the outcome measures were coded as d465 (Moving around with equipment) on the ICF, thus the authors suggested that without a subsequent level to break this category down further, this code provides insufficient detail. For example, there is no way to specify the type of equipment being used, the surface in question or whether the patient has to negotiate kerbs, inclines or thresholds. Second, the ICF does not include any subjective elements related to activity and participation. McDonald et al (2016) suggested that the ICF in itself would be a useful outcome measure in relation to wheelchair seating, positioning and mobility. 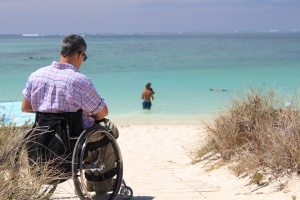 The authors note that wheelchairs have two main purposes; 1) compensating for or improving body functions and structure and 2) enhancing performance in seating, function and wheeled mobility. Thus, determining the overall success of wheelchair prescription can be a complicated task when reconciling these two purposes. In addition, these two purposes do not include social or environmental factors. 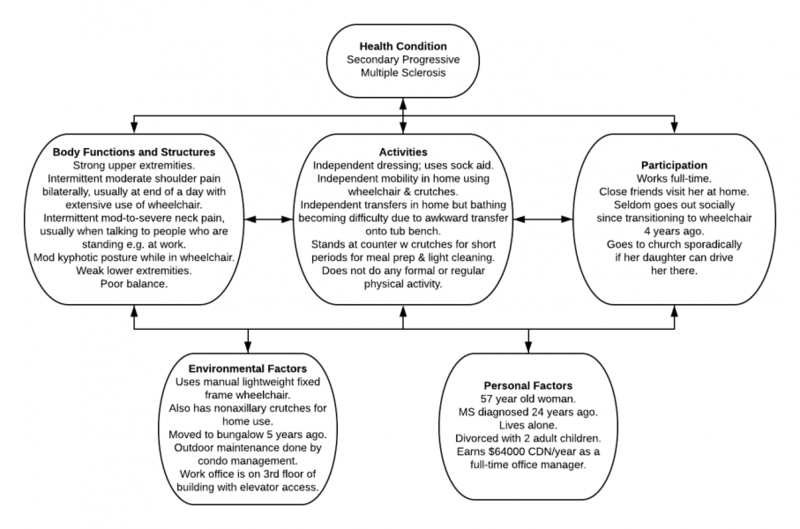 By using the ICF as an outcome measure for wheelchair prescription, all contextual factors would be considered and, importantly, given equal weight when determining the suitability of a given wheelchair for a given patient. Mrs T is a 57 year old woman who was diagnosed with relapsing remitting multiple sclerosis 24 years ago. Seven years ago, her diagnosis was adjusted to Secondary Progressive MS as the condition progressed according to its natural history. In response to progressive lower extremity weakness and disequilibrium, she was provided with a manual fixed frame wheelchair four years ago. 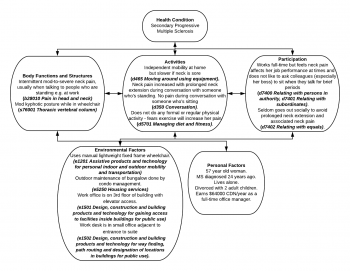 Using the ICF, Mrs T’s situation could be summarized by the following schematic. ↑ Sykes C. Health classifications 1 - An introduction to the ICF. WCPT Keynotes. World Confederation for Physical Therapy. 2006. ↑ Mortenson WB, Miller WC, Auger C. Issues for the selection of wheelchair-specific activity and participation outcome measures: a review. Archives of Physical Medicine and Rehabilitation. 2008 Jun 1;89(6):1177-86. ↑ 4.0 4.1 4.2 Requejo PS, Furumasu J, Mulroy SJ. Evidence-Based Strategies for Preserving Mobility for Elderly and Aging Manual Wheelchair Users. Top Geriatr Rehabil. 2015 Jan-Mar;31(1):26-41. ↑ Mausen S. Why wheelchair and seating assessment by ICF? Is it necessary or a waste of time? Lecture presented at 2015 International Seating Symposium; University of Pittsburgh. ↑ 6.0 6.1 Morgan KA, Engsberg JR, Gray DB. Important wheelchair skills for new manual wheelchair users: health care professional and wheelchair user perspectives. Disabil Rehabil Assist Technol. 2017 Jan;12(1):28-38. ↑ 7.0 7.1 Mortenson WB, Miller WC, Auger C. Issues for the selection of wheelchair-specific activity and participation outcome measures: a review. Arch Phys Med Rehabil. 2008 Jun;89(6):1177-86.